If you’ve been given authorization by your Lync administrator, you can quickly get started creating your own persistent chat rooms. The following sections explain how to create, manage, and disable chat rooms. On the My Rooms page that opens, click Create A New Room. When you create a chat room you’ll want to give it a unique and descriptive name. On the Create a room window, in Room Name, enter a name. A room name can contain up to 256 alphabetical, numeric, or special characters, including spaces, in any combination. Click the Check Names icon to make sure it’s not already being used. If it is, you’ll be prompted to pick another name. If you decide to change the room name later, the new name will be displayed for you and the room’s members and followers going forward. It’s a good idea, although, to find an appropriate name to start with and then stick with it. Changing a room name can create confusion for users who’ve set up notifications, or added your room as a Favorite. When you create your chat room, click Description on the Create a room window, and enter an explanation of the room’s purpose. Keep your description short (256 characters maximum), and write it so it helps others decide whether to request membership and whether to set up notifications to keep tabs on what’s being discussed in it. You can change the description at any time. Open – Anyone can find this room (via search), open it, and read and write in (“post to”) it. Open rooms have no “membership” as such. Closed – Non-members can find this room and see who is a member, but only members can open the room, read or post to it. (This is the default setting.) To join a closed room, the user must ask a manager of the room to be added to the members list. The room card identifies the chat room managers. Secret – Non-members won’t be able to find this room or its room card, learn who has membership in the room, or read or post to it. You can change the privacy setting for a room you manage at any time. For more information about chat room privacy settings and room membership, see Understanding Lync chat room membership. Depending on how your organization has decided to use Lync persistent chat, you might have access to a lot of useful web-based applications that can make the room a much more productive place for your members to spend time in. If there are web-based applications available for your room, you’ll see an Add-in heading on the Create a room window. Just click the drop-down arrow below the heading, and select the web apps you want to add. To add a room manager, open the chat room window and, in the Managers field, type the name of anyone you want to assign as a co-manager. Like you, these managers can add room members and edit some room settings. Once you’ve added your managers’ names (separated by semi-colons), be sure to click the Check Names button to confirm that Lync can identify these people. Your new co-managers won’t automatically become room members─you’ll have to add them as members. If you don’t want to notify your contacts that they’ve been made members of your room, select the No invitations sent to members button. 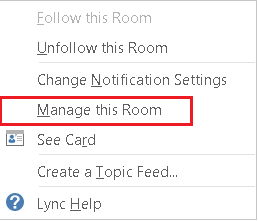 Otherwise, depending on the corresponding setting of the Parent room category your room is identified with, notifications will or will not show up in each member’s New list (just like a contact notification) on the Chat rooms view of the Lync main window. Once you’ve selected the appropriate options as described above, click the Create button. You’ve created a chat room, which makes you that chat room’s manager by default. You’ve been granted room manager permissions by the Lync administrator. You’ve been named as chat room manager by the person who created the room. You have chat room administrator permissions. This lets you manage any chat rooms in the Lync environments you control. If you’re the manager of a chat room, you’ll see your name in the Managers box on the chat room’s Room card. As a room manager, you control most of the settings of the chat rooms you manage. In addition to creating your own persistent chat rooms, you can change their privacy levels, assign additional room managers responsibilities, and add or remove members. You can change the names and descriptions of the rooms you manage, and add more web applications to the room environment, if your administrator has made them available. Finally, you can disable a room, which locks members out of the room. This table lists the action and what you can and can’t do as a room manager. Can room manager do this action? In the Lync main window, click the Chat Rooms icon to display the chat rooms view. Click the Member of pivot label to see a list of the rooms you have access to. Pause on the Chat room icon on the listing for the room whose settings you want to change. Click the Open room icon . Click the More button (lower right corner of the chat room window). You’re now on the Edit a room page, where you can change the room’s settings as previously mentioned. Click Commit Changes when you finish. A Lync chat room “category” is a collection of room characteristics that can be applied to several rooms for convenience. For example, a real estate firm might find it useful to set up a category of rooms specifically for the use of the sales team, another category for the legal department, another for the executive team, and so on. Each room category might have distinct policies on records retention, a required privacy setting, and so on. All rooms that participate in that room category would inherit those characteristics. The room-category concept affects room membership as well as settings. When Microsoft Lync 2013 Persistent Chat is first installed, your Lync administrator creates a list of potential chat room participants. Once this list has been set up, the administrator might create subcategories based on organization needs. The scope of a particular subcategory identifies all the users and groups that can be members of a chat room in that category. For example, if the administrator sets the scope of a room category to contoso.com, any group or user at Contoso can be added as a member of the rooms in that subcategory. If the scope is set to Sales, only groups and users in this distribution list can be added as members. If several room categories are available to you as a room manager, those categories are listed on the Create a room window. Select the category whose settings and membership pool you want to use. Important: The Lync administrator can lock most settings of a given room category, which prevents you and other chat room managers from making changes to the settings. Your administrator can also limit the pool of users from which you and other chat room managers can select members. 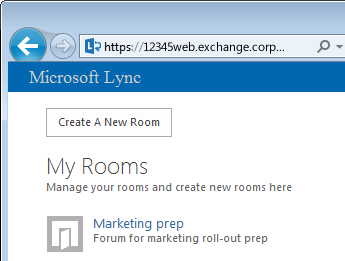 If you come across either of these situations (that is, you find you can’t change a room setting or you can’t add a specific user as a member of your room), check with the Lync administrator to see if there are restrictions in place. Sometimes you might need to disable a chat room you manage. Once you disable a room, users won’t be able to find or join it, and anyone currently joined (including you as the room manager) will be removed. Disabling a room might be necessary for a number of reasons. Maybe the room has served its purpose or has been superseded by a more active room whose focus overlaps with yours. Here’s how to disable the room. Open the Room Management window (see above), and click Disable. A dialog box prompts you to confirm that you want to disable the room. To proceed, click OK. To cancel this action, click Cancel.